UPDATE 21 December 2018 – Wensley Roofing raised £2,005 for St Oswald’s Hospice: £1,005 from selling raffle tickets and a further £1,000 donated by the company. Wensley Roofing is running a Christmas charity raffle with all proceeds going to St Oswalds Hospice. 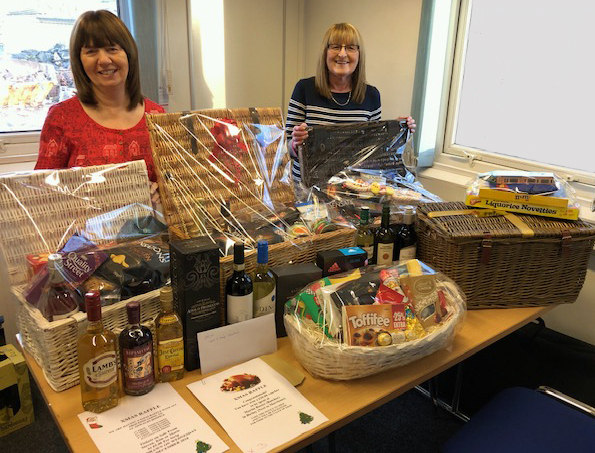 The generous staff at Wensley Roofing have donated a spectacular array of prizes including four food hampers, a sweet hamper, £50 high street shopping vouchers and a number of bottles including prosecco, whisky etc. Also Martin Baxter Butchers from Birtley has given three £20 meat vouchers as prizes. With five days to go to the draw, which will take place on Wednesday 19 December, over £640 has been raised by selling raffle tickets to Wensley Roofing’s office staff and on-site teams and to employees of the other Northern Bear group companies. Raffle tickets are available from the Wensley Roofing office in Chester-le-Street (tel 0191 387 1303). The picture shows office staff Marie Young (left) and Kim Thompson with some of the many prizes donated.